Today is International Workers Memorial Day. When we go home to our loved ones tonight, we should remember the twenty Scottish workers last year, three a week across the UK, who didn’t make it home to their families because they died at work. Deaths at work are only the tip of the iceberg. Many thousands die as a result of illness they contracted at work. While we don’t have precise figures, it is a fair assumption that since the Second World War, more people have died as a result of their work than in military combat. And it isn’t only deaths. 1.2 million workers suffered from work related illness last year – from long-standing causes such as exposure to chemicals, to the mental health pressures modern work techniques are placing on many workers. As UNISON’s annual violence at work survey shows, more than 30,000 public service workers in Scotland reported violent incidents last year. Yet we still have some employers who think violence is part of the job. IWMD is also an opportunity for us to focus on health and safety as trade unions. It should be a core part of what we all do and shouldn’t be left to a few specialists. That’s why we make a special effort today to undertake safety inspections that make our workplaces safer. Something the UK Government seeks to undermine in the Trade Union Bill. Health and safety is also under direct threat from government policy. The HSE budget is being cut in half by 2020, making enforcement the exception rather than the rule. The same applies to council environmental health departments, whose statutory safety functions have been significantly reduced. The UK Government has also pursued a de-regulation agenda that dismisses health and safety as ‘red tape’. As in so many policy areas, this government’s priority is always to put profit first and the workers are simply expendable. Wider public service cuts and job losses put extra pressures on the remaining staff, with the temptation to cut corners an ever present risk. Not to mention the physical and mental health toll it takes out of the workforce. This year there is an inevitable focus on Europe. A new TUC report finds that EU legislation has helped stop illnesses and injuries at work, and saved lives. Much of the health & safety law in the UK is now underpinned by the EU, with almost two-thirds (63%) of new British health & safety regulations introduced between 1997-2009 originating in Europe (41 out of 65 laws). The biggest cheerleaders for Brexit see protections for workers, like health and safety, as just red tape to be binned. So especially today, let’s remember the dead, but also fight for the living. 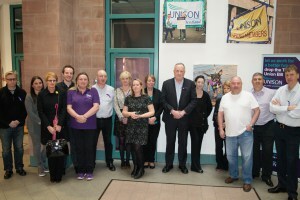 UNISON Scotland staff in Glasgow gather to mark IWMD. Today is the 30th anniversary of the Chernobyl disaster, when an uncontrolled reaction blew the roof off, spewing out a cloud of radioactive material which drifted across a swathe of Northern Europe. The contamination reached as far as Scotland and remained until 2010. Levels of radioactivity remain high in the surrounding area. A charity, Bridges to Belarus, is warning that a number of babies in a region close to Ukraine's border are still being born with serious deformities, while an unusually high rate of people have rare forms of cancer. Ukraine is not a country with its problems to seek and it is here that the impact remains the greatest. A World Health Organisation investigation suggests that populations exposed to the radioactive fallout may still be struggling with a number of health problems, including cataracts, pulmonary disease and congenital disorders. Chernobyl has had an impact on the development on nuclear power as an energy source. Safety systems are undoubtedly much stronger, but it is also a less prevalent energy source than once expected. Germany has abandoned nuclear and others are less reliant on it. In the UK the replacement programme is moving at snails pace. EDF, the French energy company promoting the £18bn reactor scheme at Hinkley, has admitted there would be no final investment decision at least till the summer. The French unions are concerned about the financial impact on the company and have invoked a consultation process. Hinkley has attracted criticism in the UK from a range of sources, including the City and environmental groups, as an overly-expensive project. The government has promised to pay £92.50 per megawatt hour for the power over 35 years - double the current cost. In Scotland we are still heavily dependent on nuclear power from Hunterston and Torness as a source of base load electricity. One third of our electricity generation comes from these two plants, which operate even when the wind doesn't blow and the sun stops shining. Even the anti-nuclear Scottish Government has not opposed life extensions to both plants. Those who argue that there is a case for replacing at least one nuclear plant recognise it isn't going to happen. If Hinkley is struggling to get off the ground in a benign political environment, there is no prospect of a company investing in Scotland. 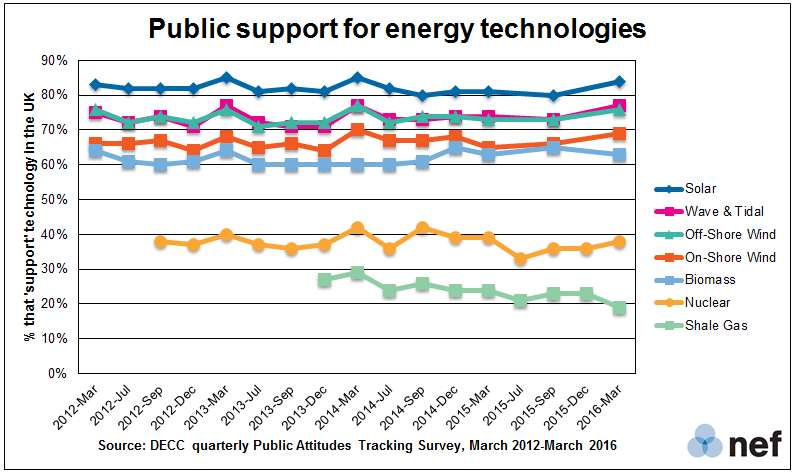 There is a certain irony that a dirty energy source such as fracking has more support amongst Scottish ministers. Given the complexity and costs associated with a conventional nuclear power station, many in the industry are investing their hopes in mini-reactors. The U.K. Government wants to be a “global leader in innovative nuclear technologies”. Part of this plan involves spending £250m on a research and development programme to put the UK in with a chance of "winning” the race to develop small modular reactors (SMR). SMR's are essentially scaled down reactors that generate around a third of the output from a current nuclear power station, or 10% of that planned at Hinkley. That's enough power for 1 million people all the year around, compared to the 26% output from the best wind turbines that supply less than 10,000 people. The main advantage is probably smaller start up costs, making it a less risky investment. They can be built centrally and moved to the site. Smaller output is easier to manage on the grid and they have good safety features including an underground cooling system that makes Japanese style core meltdown unlikely. The main drawback is the increased running costs. Each kilowatt hour (kWh) of electricity from an SMR would be expected to cost between 15% and 70% more than a kWh of electricity produced in a full-sized nuclear power station, due to economies of scale. SMRs are being built in China, India and Russia and the UK government's competition should deliver progress in the UK. On the other hand, we all remember the shambles of the CSS competition, which dragged on for years and was then abandoned. So, on the 30th anniversary of Chernobyl we should remember the human cost of that tragedy that continues to this day. However, safety is probably the least concern with a new generation of reactors - financial cost is a much larger issue. SMRs may offer a cost effective alternative source of base load generation, but don't expect to see any in Scotland soon. Well that was different! 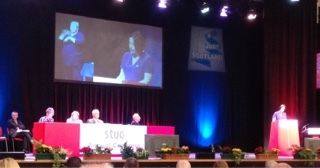 Kez Dugdale's speech to STUC Congress today broke the mould. Past Scottish Labour leaders have come to Congress and launched into a lengthy attach on their political opponents - sounding like a tribal rant. What most delegates to Congress want to hear from politicians is what are they going to do for working people - not what their opponents haven't. Kez's speech did just that. The focus of her speech, unsurprisingly, talked about what Labour will do the new powers that are now on the statue books. She asked, "Will we use the new powers of the Scottish Parliament or will we continue with Tory cuts?" Labour's main promise in this election is that any Labour Scottish Government will increase spending on public services in Scotland. That came with a good line, "We know that austerity is not an act of God, it is a political choice." She went on to explain how Scottish Labour will fund public services; by not raising the threshold for the higher rate and that includes inflation; a top rate of 50% for those earning £150k; and 1p on the basic rate. A particularly well received commitment was to take a tougher line with those who avoid tax. She said, "We will make sure that those who do not pay their taxes do not get taxpayers’ money. There should be no public contracts for those who avoid tax." She then highlighted the true cost of cuts - thousands upon thousands of jobs being lost and the rest of us losing local services. Moving on from austerity she set out a new approach to working with trade unions. Starting with a repeat of her commitment not to comply with the Trade Union Bill and then setting out a new positive approach through a Work and Trade Union Bill. This Bill will recognise the positive role of trade unions in the economy, in creating better workplaces, increasing productivity and building a fair economy. A new agency, Skills Scotland, will be established in partnership with unions and employers and co-chaired by a nominee of the STUC. It will bring together employment services and skills services, including the new powers over the Work Programme. - Keeping CalMac in public hands and immediately halting the tendering process. - Regulate bus services & bring Scotrail under public ownership. - Ban exploitative zero hours contracts with a focus on care workers. - Abolish for good the bedroom tax and create a new approach to social security in Scotland that offers dignity and tackles poverty. - A full inquiry into the practice of blacklisting of trade unionists in Scotland. - Dropping the extortionate pre-devolution interest that hangs around the necks of councils across Scotland. She ended with an appreciation of how hard Scottish Labour has to work to convince people of Labour's case: "Will we use the new powers or will we make more cuts?" - seems a good place to start. Collapsing Edinburgh schools are a metaphor for the folly of PPP schemes that have cost the taxpayers £billions. This latest scandal should be used as an opportunity to think again. Fears over safety has forced the closure of 17 Edinburgh schools due to concerns over the standard of construction, leaving 7,000 pupils unable to return to classrooms following the Easter break. Every Scottish council is now carrying out surveys of schools that could be affected. The schools were all built under the same public private partnership contract by Edinburgh Schools Partnership (ESP). This is a Special Purpose Vehicle - essentially a company set up to run this scheme, owned by the partner companies that are responsible for the contract. This is how most Public Private Partnerships (PPP) are operated. There are a number of different schemes that come under this umbrella term, including PFI, NPD and the Hub Initiative. The common feature is that private companies finance and then operate a public service building for a contracted period, typically 25 years or longer. They were started by the Tories, developed by Labour and continued by the SNP, who have one of the largest PPP programmes in Europe. While UNISON opposed PPP schemes from the outset, it is only fair to point out that construction failure is not an inherent element in PPP schemes. They can happen with any construction project and we don't at this stage have all the information on the precise problems with these buildings. However, there are some reasons why such failures are a bigger risk in PPP schemes. Firstly, the construction company in a PPP scheme is almost always an equity partner of the SPV running the scheme. In effect this means they are both the client and the contractor. Unlike conventional procurement, there is no council or other public service provider performing the supervisory client role. Secondly, there is a profit incentive to keep costs to the minimum. Any saving that the construction partner can make, increases profits to both the construction company and the other SPV partners. There is therefore a stronger cost saving incentive than in conventional procurement. Thirdly, many PPP schemes have been under pressure to cut costs late in the project because of budget overrun. We know that this has resulted in specification cuts, such as fewer beds in PPP hospitals and the loss of planned teaching areas in PPP schools. There is bound to be a concern that this may drive construction changes as well. Fourthly, PPP schemes tend to use standard designs to keep architectural costs to a minimum. This has been criticised on aesthetic grounds because designs don't always reflect the local setting. It also means that a design feature that fails, could have implications for not one building, but many. I should emphasise that I don't believe that this means that anyone has deliberately done anything that is unsafe. However, PPP schemes do not have all the checks and balances that happen with conventional procurement. Our concerns over PPP primarily relate to the inflexibility of long term contracts and cost. In our latest report on this issue late last year, we argue that with interest rates at historic lows, now is an ideal time to review the cost of PPP schemes that were signed when interest rates were much higher. It is now widely accepted and understood that PPP projects have been extremely expensive ways of funding new hospitals and schools. Estimates of how much the public sector could save now through buying out PPP contracts range as high as £12 billion in Scotland. Whatever the cause of the construction failures in the Edinburgh Schools scheme, this should be yet another wake up call on the inherent weaknesses in this method of funding public services. Bringing PPP schemes into the public sector is a safer and more cost effective solution for public service delivery. 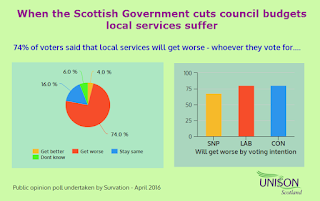 Scottish Parliament elections: it's public services stupid! 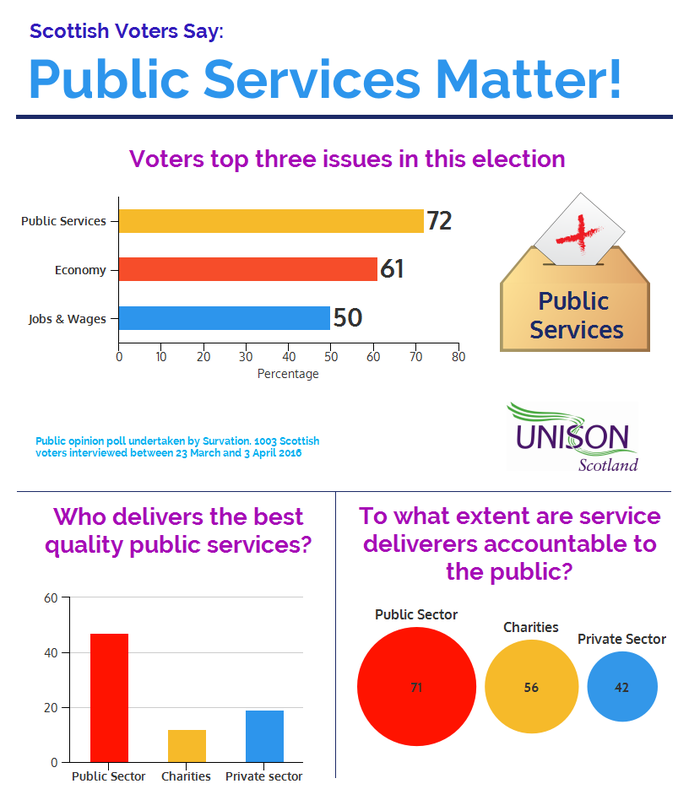 Public services are Scottish voters highest priority in the May elections. 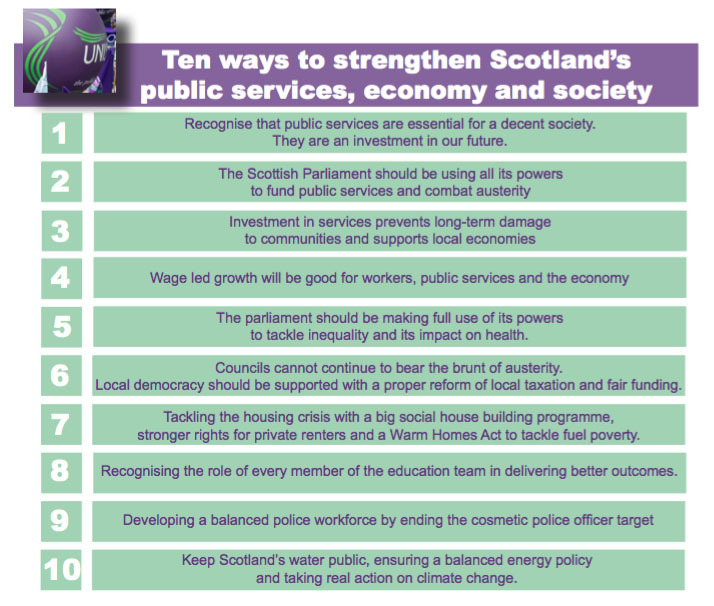 Good news for UNISON Scotland as we publish our manifesto for the elections, ‘Public Services and the Good Society’. The manifesto does have the traditional shopping list of actions we would like the next Scottish Government to take – ten of them in fact. However, it does much more than that. It seeks to tell the story of why public services matter – to everyone in Scotland and our economy. We know public services are voters’ highest priority because we commissioned the pollsters Survation to undertake a public opinion poll on the key issues for UNISON members. 72% said public services were in their top three issues followed by the economy (61%) and job security/wages (50%). Scottish Labour and SNP voters’ priorities were almost identical. Conservative voters had the economy over public services and topically, the EU as their third top three issue. It appears the warring referendum factions in the Tory party understand their internal audience at least! UNISON also has a view on who should generally deliver public services, and the public agrees. 47% responded that the public sector delivers the best quality public services compared to the private sector (19%) and charities/social enterprises (12%). That was a particularly low score for the Third Sector and may reflect recent bad publicity. The public sector is also seen as the most accountable to the public (71%), compared to charities (56%) and the private sector (42%). 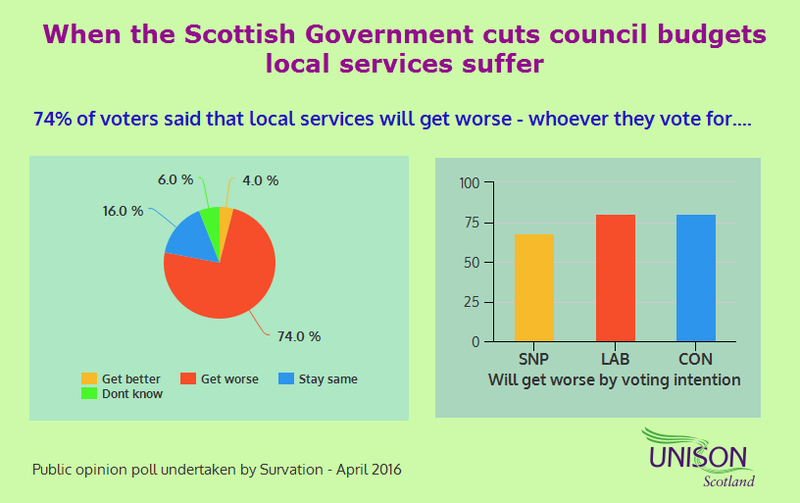 There was an overwhelming recognition (74%) that the £500m cut in the Scottish Government budget allocation to councils will mean that local services will get worse. This was just about the only thing Scottish Labour and Conservative voters agreed on (80%), but so did two-thirds (68%) of SNP voters. This election has been the first since devolution when taxation has been as big an issue as spending. The new devolved powers have at least started a debate on an issue politicians in Scotland have usually avoided. Unsurprisingly, given low wages and a weak economy there was not a dash to pay more tax. However, 43% of voters indicated they would be willing to pay an extra 1p in income tax in order to protect some public services from cuts. A further 25% might be willing and only 23% would not be willing. I would argue that is at least a base for an understanding that we cannot have quality public services unless we recognise that most taxpayers will have to contribute to the pot. 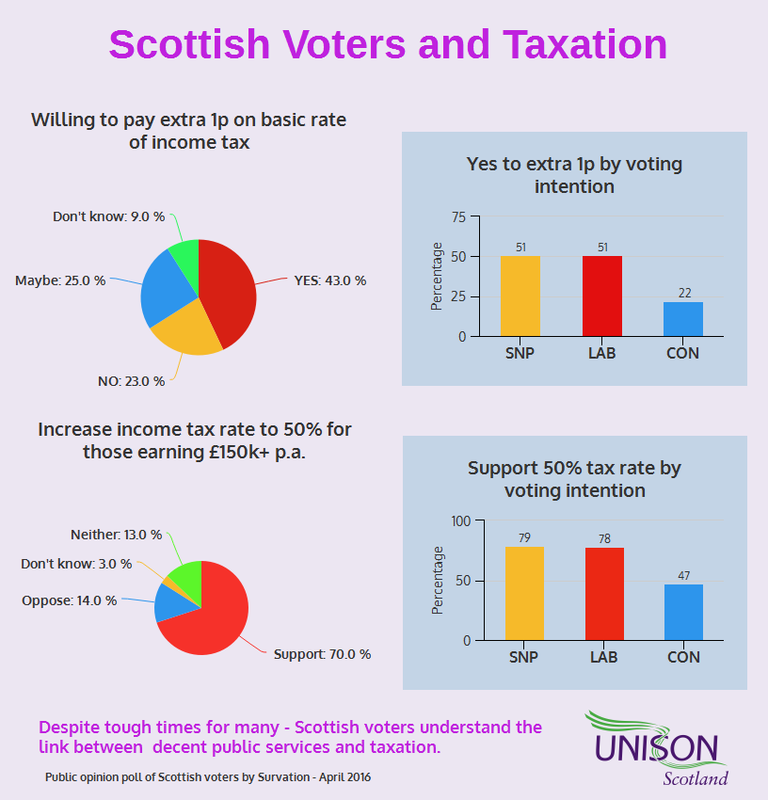 Interestingly, given their party’s different policy positions on this issue; Scottish Labour and SNP voters had almost identical views on the 1p tax increase; while only 22% of Conservatives indicated a willingness to pay extra tax. Support for progressive taxation is much stronger when it comes to the highest paid. 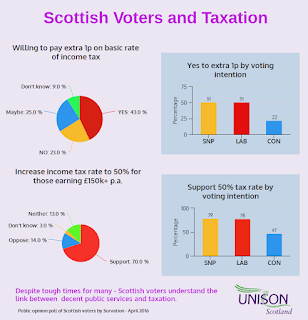 There was much greater support for a 50% tax rate for those earning over £150k per annum. 70% of respondents supported this, rising to 78% among Scottish Labour voters and 79% among SNP voters. Ruth Davidson might like to note that even a majority of Conservative voters were in favour (47% v 35%). There was strong cross party support (76%) for government taking tax avoidance into account when awarding public contracts. 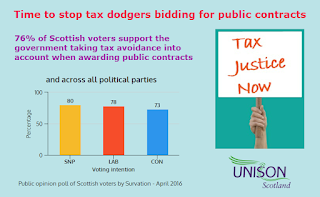 This is something UNISON and others in the ‘Ten Asks’ civil society coalition have been pressing the Scottish Government to do, with only limited success. Scottish Ministers might like to note that 80% of SNP voters agree with us. It has been widely reported that the new individual registration system has resulted in a fall in the numbers registered to vote. The nature of polling means that respondents are less likely to be in this group, therefore the fact that 90% believed they were registered to vote, still leaves some questions over the impact of the new system. Respondents were fairly evenly divided on sources of local revenue, but recognised that if a greater proportion was raised locally, services would be more accountable to the needs of residents. Finally, we usually ask a question on trusted sources of information in relation to public services. Unsurprisingly, those interviewed trusted friends and family (72%) the most, followed by academics (54%) then public sector trade unions (35%). The media (18%) was slightly more trusted than Westminster politicians (14%), although less than Holyrood politicians (28%). It would appear that the change of the guard at Westminster hasn’t changed public perceptions at all!